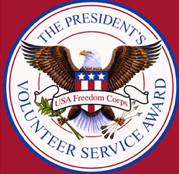 The President Volunteer Service Awards (PVSA ) is an initiative of the Corporation for National and Community Service (CNCS) and is administered by Points of Light. With a shared mission of inspiring more to answer the call to service, PVSA celebrates the impact we can all make in bettering our communities and our world. 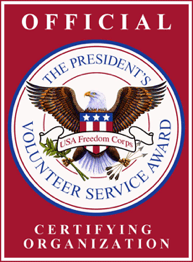 Presidential recognition sets the volunteer/service learner apart from peers. It is a tremendous honor. Even though servant leaders may not seek recognition, their example can deliver a powerful message that encourages others to take action. • Court-ordered community service does not qualify for the award. • Awards are issued by approved Certifying Organizations. Awards cannot be ordered if applicants do not have a file at the awards site linked to the Joshua’s Hands Award Website. • Register and complete a profile. 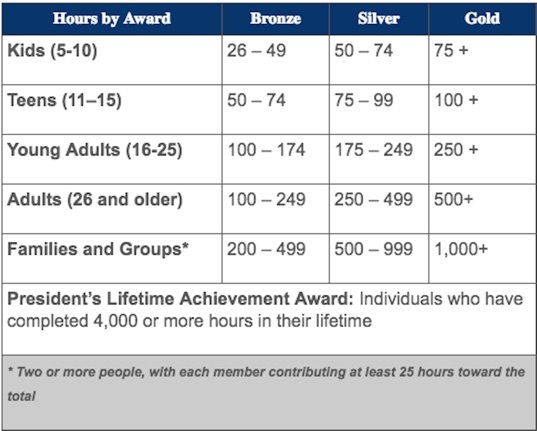 • Record your volunteer hours and activities to track your progress towards a bronze, silver, gold, or Lifetime Achievement President's Volunteer Service Award. •You will be responsible for entering all volunteer hours and associated documentation, including site supervisor.